Ecology is the study of patterns of relationships between organisms and their environment (Green et al. 2001). When applied to asthma, investigators have taken several different approaches to the “environment,” usually by studying the effect of the environment on the “organism” defined as people with asthma (Harper 2004; Hart and Whitehead 1990; Stoloff 2000; Lanphear et al. 2001; Gold and Wright 2005; Bousquet et al. 2005; Milton et al. 2004; Parkes et al. 2003; Redd 2002). The exact approach depends on the expertise of the investigator from anthropologist to health services researcher to atmospheric scientist. In each case, the environment is seen through the lenses of the specific scientific discipline. In this regard, few authors have viewed the ‘asthma environment’ through the lens of the patient or family dealing with asthma. Such a view requires knowledge of the social ecology of asthma that has been addressed most commonly in children with asthma as the nested arrangement of family, school, neighborhood, and community (Earls and Carlson 2001; Klinnert et al. 2002). 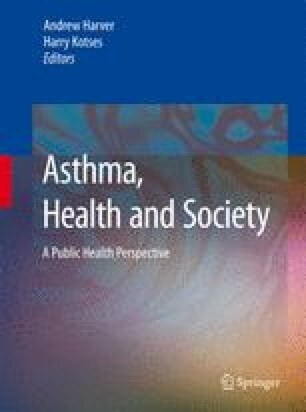 In this chapter, the work published under the key terms of asthma and ecology will be reviewed and when possible integrated into a holistic approach. The perspective of the person (organism) with asthma will be emphasized. It is the patient centered ecology of asthma that becomes pertinent, and highly relevant to the people who live with work with and suffer from asthma (Fig. 5.1).